At last…an action shot of The Maria Wrap Apron in her natural surroundings. She was named after my very lovely and creative friend Maria, who is a textile artist – you can see her work here. The apron was created following a conversation with Maria and another friend Miss Kitty about garments that are missing from our lives, a Japanese style makers apron was needed for creating and for messy print work in the Design Studio. That conversation grew and evolved and now, as a result, I’m naming all of my patterns after the very inspiring ladies I’ve been lucky to meet along my journey, but I’ll tell you more about them another day. This is the full back pinafore dress version (version B), with a tie fastening on the side. You’ll need to wear something under her – perhaps leggings, I’m quite keen on wearing her with my jeans. She looks great with a skinny t-shirt underneath – the styling makes her quite low on the sides so that is more of a necessity than a suggestion! 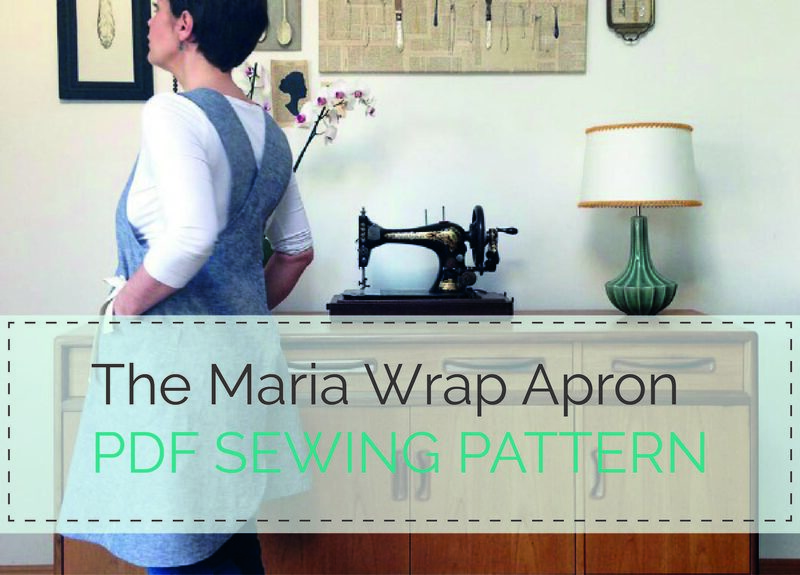 So, just a little re-cap…The Maria wrap Apron by Maven Patterns. Perfect for a day in the studio, as a dress she is great for a day of (fabric) shopping, perfect as a practical apron for ones domestic duties. And, honestly, there really isn’t a better apron to wear while staring wistfully at the kitchen wall…. Already purchased this pattern and I am unable to download and print it… please help! Hi Nancy, Can I get you to contact me through Etsy? I think you’ve ordered it 3 times and I need to check I have the right orders for you.